The crystal ball glimmered with an iridescence of days of future past. The nearby flickering candles threw shadows of things yet to be upon the orbs crystalline matrix. The prophet, withered and aged, breathed deeply of the sweet, smokey air and continued to gaze into the heart of the crystal. Deep within his brain, universal connections that bind us all in a web of consciousness are stimulated by the hypnotic shapes that danced faintly in the ball. Time and space are one and all information contained within reality are available to those who can master their intellect and allow the stream of information to be downloaded directly into the brain. This bypasses the rational mind that would block anything received through such unconventional methods. 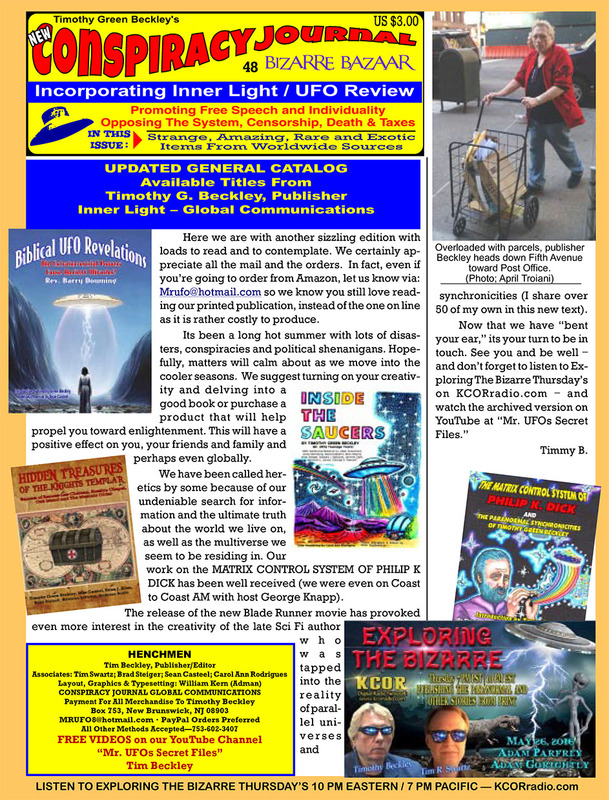 The prophet sighs in contentment -- because once again his crystal ball has brought him his subscription to Conspiracy Journal, the free weekly e-mail newsletter of everything weird and strange from the past, present and future. 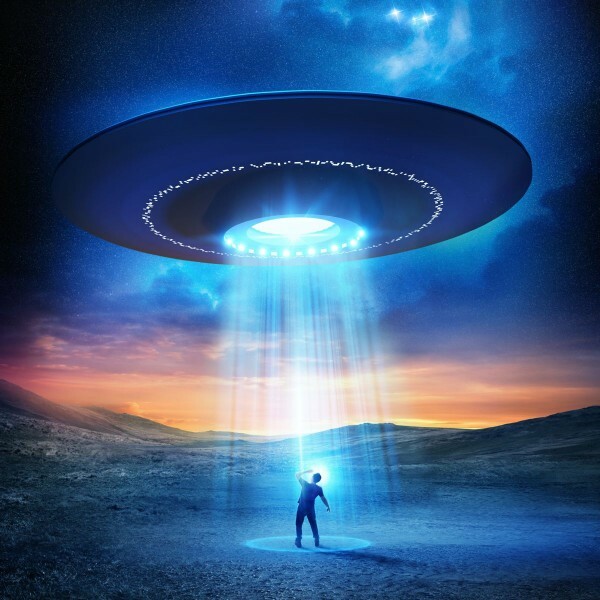 Pentagon Reports On Warp Drive and Other "Exotic Science"
The documents were first discovered by George Knapp's I-Team, part of Las Vegas CBS affiliate Channel 8 News, which has been investigating the government's supposed connection with 'UFOs' for decades. Recently Knapp has been digging deeper into Bigelow Aerospace—which is located in Las Vegas—and its starring role in the previously classified program. It is no secret that Robert Bigelow, a former real estate developer turned inflatable space station entrepreneur, has been highly interested in UFOs, but the depth of the company's official relationship with the Defense Department regarding the topic was something entirely unheard of before the disclosure of the Defense Intelligence Agency's (DIA) Advanced Aviation Threat Identification Program occurred in December 2017. 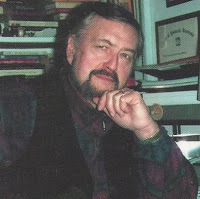 Paranormal phenomena icon Brad Steiger (Eugene E. Olson) died Sunday, May 6, at age 82. He had been in deteriorating health and was in hospice care. Steiger wrote nearly 200 books and scores of articles on paranormal phenomena. 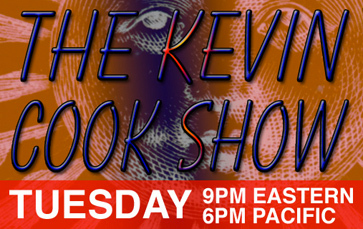 UFO’s, psychical research, ghosts and hauntings, archaeological enigmas, monsters, life after death, the Bermuda Triangle, Atlantis— no topic was off limits. Back in the 1970’s, it was difficult to go anywhere and not find a Brad Steiger book. “Mysteries of Time and Space,” “Atlantis Rising,” “Project Blue Book.” The man was prolific and passionate regarding his craft. As an 11-year-old Iowa boy, Brad was nearly killed in a farming accident. He had a near-death experience which sparked his interest in the unknown. It gave him a personal perspective and glimpse into what awaits us all. Brad was a deep thinker and was often ahead of the curve. Back in the 1960’s Brad and John Keel began seeing commonalities between phenomena other researchers would segment. 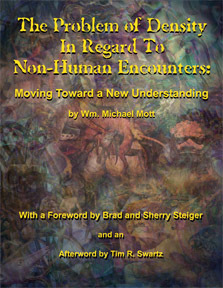 Brad wrote of possible connections between Ufology and cryptozoology. In 1976, Steiger teamed with Hayden C. Hewes to author “Missionaries Extraordinary.” It was an in-depth look into what would later be known as the “Heaven’s Gate” suicide cult— 23-years later. You may remember Steiger appearing on ABC’s “Nightline.” (“Star Trek Note: Nichelle Nichols’ brother was one of the victims). When I was a teenager, I wrote a letter to Brad. To my astonishment, he not only responded, he sent me a copy of his “Alien Meetings” with the inscription “Keep one eye to the sky, the other within. Peace. Light. Awareness. Brad Steiger.” For the next 38-years we corresponded off an on. I was fortunate enough to have been included in a few of Steiger’s projects. I wrote the Amityville section (just a couple pages) of his mammoth “Real Ghosts, Restless Spirits, And Haunted Places.” They included some pictures from Lorraine Warren and a photo of the famous, or infamous, Long Island home on the cover. His sequel included an article I wrote on the Whitehall poltergeist. My creature and entity research was also included in “Out of the Dark” and “Real Monsters, Gruesome Critters, And Beasts From The Darkside.” Brad was always extremely kind to me. Brad was a monthly guest on radio’s “The Jeff Rense Show” and appeared frequently on “Coast To Coast AM.” In fact, he co-wrote “The Source” with Art Bell. When discussing Brad with his friend of over a half-century, Tim Beckley said, “Brad has no enemies.” Skeptics, believers, scientists, laymen, “experiences,” writers, researchers— he could relate to all. He was smart, witty and charming. It is difficult to think of a world without Brad Steiger. We can take great comfort in the volume of work he produced and the many souls he touched over the years. He often said this was “Schoolhouse Earth.” That being the case, Brad has graduated to the next level. My thoughts and prayers go out to his wife (and soulmate) Sherry and the Steiger family. Stephen Hawking’s family have invited time travelers to his memorial service, seeking to tackle one of the curiosities that eluded the British physicist during his extraordinary life. The world’s most recognizable scientist died in March aged 76 after a lifetime spent probing the origins of the universe, the mysteries of black holes and the nature of time itself. Members of the public have been invited to apply for tickets to attend a celebration of Hawking’s life at a memorial service in Westminster Abbey on June 15 where his ashes will be interred alongside the graves of Isaac Newton and Charles Darwin. Those wishing to apply have to fill in a form and state their date of birth, which can be any day up to the end of 2038. The option to have a date of birth in the future was spotted by London blogger ianvisits who wrote on his site: “Professor Hawking once threw a party for time travelers, to see if any would turn up if he posted the invite after the party. Sarah Bridle, a professor of Astrophysics at the University of Manchester, told BBC Radio that Hawking, who was confined to a wheelchair for most of his life, had remained curious about the potential for time travel, even after his party in 2009. During the great UFO sighting outbreak of early November 1957, a number of close encounters had a disturbing consequence: burns and related injuries to witnesses. One of the most dramatic occurrences took place at an army base at Itaipu along Brazil's Atlantic coast. At 2 A.M. on November 4 two guards saw a luminous orange disc coming in over the ocean at a low altitude and an alarming rate of speed. As it passed above the soldiers, the disc came to an instant stop. The two witnesses suddenly felt a wave of heat and a horrifying sensation as if they had burst into flame. Their screams brought other soldiers stumbling out of their barracks just in time to see the UFO streak away. At that moment the fort's entire electrical system failed. Amid great secrecy the two men were rushed to a military hospital and treated during the next few weeks for first-and second-degree burns to ten percent of their bodies. But there were other burn cases as well. In the afternoon of the same day as the Itaipu incident, the engines of several cars along a rural highway near Orogrande, New Mexico, ceased to function as an egg-shaped object maneuvered close by. A witness who stood particularly close to it contracted a "sunburn." In the early morning hours of November 6, outside Merom, Indiana, a hovering UFO, which bathed his farm in light, also seriously burned René Gilham's face. He ended up spending two days in the hospital. At around 1:30 A.M. on November 10, a Madison, Ohio, woman saw an acorn-shaped UFO hovering just behind her garage. She watched it for half an hour. In the days afterward she developed a body rash and vision problems that her doctor believed suggested radiation poisoning. Subsequent medical tests uncovered no apparent cause for her injuries. Studying the brilliant light in the stand of trees two and a half miles south of him, Marshall County Deputy Sheriff Val Johnson wondered if drug smugglers had flown over the Canadian border into the flat, isolated terrain of far northwestern Minnesota. The light was close to the ground, suggesting that the plane had either landed or crashed. Or maybe there was some simpler explanation. Johnson headed down the county highway to investigate. It was 1:40 A.M. on August 27, 1979. The next thing Johnson knew, the light was shooting directly toward him, moving so fast that its passage seemed almost instantaneous. The last thing he heard was the sound of breaking glass.At 2:19 A.M. a weak voice crackled over the radio in the sheriff's dispatcher's office at Warren, Minnesota. It was Johnson, who had just regained consciousness. His car had skidded sideways and now was stretched at an angle across the northbound lane, its front tilting toward the ditch. Asked what happened, Johnson could only reply, "I don't know. Something just hit my car." Officers who arrived on the scene found the car had sustained strange damage, including a seriously cracked windshield, a bent antenna, smashed lights, and other damage. Both the car clock and Johnson's wrist watch were running 14 minutes slow, though both had been keeping correct time until the UFO incident. Johnson's eyes hurt badly as if, an examining physician declared, from "welding burns." Allan Hendry of the. Center for UFO Studies along with experts from Ford and Honeywell conducted an extensive investigation. Their conclusion: The windshield damage was caused by stones apparently carried in the wake of the unknown object. The Honeywell expert thought the bent antenna probably resulted from a "high-velocity air blast superimposed on the air movement over the fast-moving car." Arcesio Bermudez was a 54-year-old Colombian who died after a close encounter with a UFO. On the evening of July 4, 1969 in the town of Anolaima, municipality of Cundinamarca, Arcesio's family climbed a hill to do some star gazing, and spotted a small light in the sky that suddenly flew closer to the family and grew brighter. Arcesio decided to point his flashlight at the unknown object and he was rewarded with what he said was a "magnetic blast," causing him to feel sick, eventually developing signs of hypothermia. Bermudez's illness continued for three days until a relative came to take him to Bogotá for treatment. According to his family, Bermúdez was cold to the touch, and that he leaned against his sister's side in the car. Afterwards, his sister claimed that of her body "remained cold until the day she died." Bermudez's preternatural chill was such that the nurses at the Bogotá health center were unable to draw blood samples, as his vital fluid had "crystallized." Bermudez was treated by César Emerald, Secretary of Health in Bogotá at the time. The physician would recall that his patient was in a state of hypothermia, with no temperature readings. Dr. Emerald was never able to ascertain the root cause of this chill. After being hospitalized for several days, experiencing intense fever, Bermudez died. A detailed medical report was published in the July 17, 1969 issue of the "El Espectador" newspaper. Dr. Emerald is quoted as saying: "The patient was very ill. He presented a cardiac condition, third-degree dehydration brought about by vomiting and diarrhea, and it was impossible for me to control his sickness. Nothing could be done for him. It struck me that the patient should be hypothermic, that is to say, that he should have no temperature whatsoever. All I can tell you is that according to his sickness, the patient should've had a temperature reading, but in fact did not have one. I am speaking from a medical standpoint; therefore I cannot associate his death with the presence of the object [UFO] you are telling me about." A group of APRO investigators from the United States theorized that Bermudez had died from a massive dose of gamma rays and requested that the man's cadaver be exhumed - something the family refused to do. Years later, when Bermudez's remains were about to be transferred, the Bermúdez family discovered to their horror that the body had disappeared, apparently taken away by unknown hands. And The Evil Alien Agenda: Lethal Encounters With Ultra-Terrestrials Exposed"
John Knott, the owner of Quadrille, a fabric and wall coverings company based in Manhattan, expected surprises when he bought a weekend home in the country, an 1839 Greek Revival house in Kinderhook in Columbia County, N.Y. Inconveniences were bound to crop up — a leaky roof, problematic plumbing, boiler issues. But he was not expecting ghosts. Even after the signs began to appear, he was skeptical. A French guest was roused from a deep slumber at dawn — despite wearing earplugs — by repeated rapping noises on his bedroom door, though no one had knocked. A visitor staying in an upstairs bedroom awoke to a startling vision of African slaves working in fields. And a close friend, the New York florist Helena Lehane, cut a visit short after being beset by torturous nightmares; her screams — described by Mr. Knott as bloodcurdling — sent everyone running into her room. Ms. Lehane, who describes herself as psychically sensitive, recalls her experience in the house as an encounter with a “malevolent presence.” She hightailed it back to Manhattan the next morning. The heavy breather hasn’t reappeared, but if he does, Mr. Knott is prepared to treat him with respect. The Hudson Valley has long inspired tales of the supernatural, many of them set in Columbia County, east of the river some 30 miles south of Albany. The area fed the spook-seeking imagination of Washington Irving, who gathered material for “The Legend of Sleepy Hollow” while living in Kinderhook as a tutor to the children of Peter Van Ness, a prominent local judge. Nearly two centuries later, Hans von Behr, a retired metallurgist and photographer from Greenwich Village, used 17 accounts of haunted houses in Columbia County — including his own summer home in Old Chatham — in his book “Ghosts in Residence” (North Country, 1986). Mr. von Behr’s house, built in 1790 and known as the Old Chase Place, had a reputation as haunted, said his son, Bob, who now lives there full-time with his wife, daughter and mother. During the days when his father entertained there as a bachelor, Bob von Behr said, houseguests reported rushes of cold air, visions of floating figures, footsteps and rattlings, although now things have quieted down. 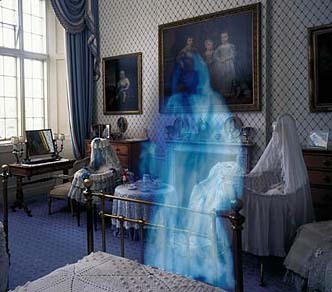 “We’re convinced our ghost has moved out because our family is too boring or too noisy,” he said. While longtime residents are hardly immune, the spirits seem to have a particular affinity for the urban outsiders who buy big old houses as second homes. Lured by the romance of restoring an old dwelling, a weekender may feel a sudden unease when the time comes to settle into slumber in a big, creaky house on a lonely road. The discomfort grows if neighbors pass along rumors that the house is haunted. Jean Hamilton, the chief executive of Xonos, an Internet commerce and software company, and a member of an investment banking firm, and her husband found themselves with a less friendly ghost at Broadstairs, their house in the Columbia County town of Ghent. They shrugged off vague rumors of hauntings before buying in 1984; they had fallen in love with the house, a 10-room, three-bathroom 1720 center-hall Colonial that was once an inn and is situated on 350 acres. “We prided ourselves as hard-headed realists, and we were definitely nonbelievers,” Ms. Hamilton said. Even after they moved in and began hearing odd noises — what sounded like furniture being rearranged, a low chorus of murmurs on the landing and footsteps in the dead of night — they brushed off supernatural explanations. Then a guest, Bill Placke, a banker from Summit, N.J., was dozing off in the guest bedroom, lying next to his sleeping wife, he said, when a smiling skeletal apparition robed in a white gown and ruffled collar appeared at the foot of his bed. It bobbed toward him, then vanished. “I have never been gripped by such fear!” he confessed. Ms. Hamilton and her husband researched the history of their house and found it had been the site of at least two murders: in 1791 a former owner, Cornelius Hogeboom, had been shot on the premises, and a century later John Schmidt, a farmer employed at Broadstairs, beat his stepson to death with a hammer and was accused of killing another man, whose body was found buried in the cellar. It all makes sense to Dr. Hans Holzer, who lives in Manhattan and has written over 100 books on the paranormal, including “Ghosts” (Black Dog & Leventhal Publishers, 1997). In cases of unnatural or violent deaths, the etheric body (aura, soul) may fail to make a transition to “the other side,” he said, because it is unaware of its own death or has unfinished business. Dr. Paul Kurtz, a well known skeptic about all things supernatural, offers less romantic explanations. 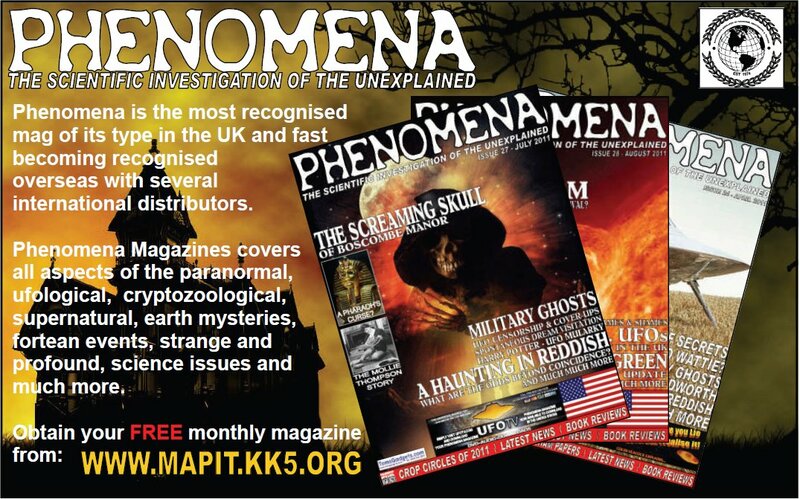 “Knowing the history of a house can stimulate creative imagination,” said Dr. Kurtz, chairman of the Committee of Scientific Investigation of Claims of the Paranormal in Amherst, N.Y., which publishes Skeptical Inquirer magazine. He even has personal experience. About 35 years ago, he said, he and his wife bought an old farmhouse in Saratoga County. From the day they moved in, they began hearing strange, disturbing noises, and their initial alarm was fueled by local gossip that their house was haunted. Upon further investigation, however, it turned out their ghost was a den of squirrels rolling acorns on the attic floor. What most terrifies many owners with houses said to be haunted is not the ghost itself, but its possible deterrent effect on future buyers. Sellers tend to keep quiet about resident spirits, and real estate agents may do the same. Disclosing the presence of a ghost isn’t normally required by law, although a 1991 court case canceled a $650,000 deal downriver in another Hudson River town, Nyack, N.Y., on a related point. The prospective buyers, who lived an hour away and weren’t familiar with local lore, complained that they hadn’t been told that the house had a reputation as haunted. The court ruled that the owner had potentially injured the buyers’ resale value by including her house as a “haunted” attraction on local walking tours and telling the local press about it in interviews. Sometimes an owner (the seller in Nyack apparently was an example) actually relishes a house’s reputation as haunted, talking proudly about it to friends and strangers alike. And country inns have been known to advertise their rumored ghosts as attractions on their Web sites. A train passenger claims he saw a Bigfoot-like creature walking in a field while on a train from Exeter to Bristol. The eye-witness said he was on a train to Bristol Temple Meads, which was approaching the city on a Friday morning in November last year, when he saw a massive creature taking huge strides along a hedgerow. The Bristol Post write that the report was made to the British Bigfoot Sightings group – a team of researchers based around the country who collect and investigate sightings of upright hairy ape-like creatures in this country. The man reported that he left Exeter late in the morning, and there were few people on the train as it approached Bristol. “In my carriage was probably ten to 12 people - most of them with their head in either mobile phones or morning newspapers,” he told researchers. “I haven’t been on a train for years so I was keen to take in the scenery. 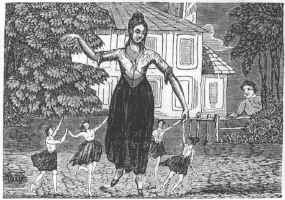 “About ten miles from Bristol we were travelling through an area and in the fields to my right I saw something large in the middle of the field walking, it was walking kind of hunched over, and all I could tell you was it was a black figure. “At a guess I would’ve said it was 70 to 100 metres away from the train. My eyes were glued on it at this point. “I was watching the way the ‘thing’ was walking, almost towards the side of the field, it was edged right up to the hedgerow as if to walk alongside the hedge itself, almost like it was using the hedge for cover? “To my eye whatever it was seemed to take massive strides, and ‘it’ was covering the ground very quickly. “As I spun my head to the left to see if anybody else on the train had seen what I was looking at, I was surprised to see that nobody was really looking out from the seats in my direction, or any direction other than down to be fair,” he added. If the eye-witness's judgement that the sighting took place around ten miles before the train arrived at Temple Meads is accurate, it would put the sighting to the south of the railway line between Nailsea and Yatton stations. The countryside in this point is low-lying wetland, between the M5 and the wooded hillside escarpment that runs up to Bristol Airport. “I would imagine five to ten seconds was all I saw it for,” the eyewitness added. “But it stood out to me as strange. To start off with, I didn’t think it was a Bigfoot or anything like that, until I watched how it walked and the way it hugged the hedgerow. “I thought it was just somebody walking through a field, and if they were not acting in such a strange manner, with a strange gait, and hugging the bushes to stay hidden, surely a person wouldn’t do that? Or would look like that? “Then, about two minutes later, after viewing this figure I saw a couple walking a collie dog in a field, roughly the same distance that I’d seen the black figure. “They were to the side of the hedge line. I was gobsmacked to see that I could hardly make them out, I mean, I knew they were humans walking with the dog but I couldn’t really see what they were wearing apart from the brightly coloured coats. “And it dawned on me that they were probably of average size male and female, although what I had seen five minutes earlier was clearly not. It was an all-black figure in a field, ‘it’ was huge. “I could see the black figured arms and legs and chest, compared to the two humans I had just seen walking the dog. “At the point of seeing the black figure I realise the tree line behind it was probably around 200 m away and had a thick dense forest behind it. I have no proof whatsoever to show you, only my word. “I’m 100 per cent sure what I saw was the English Bigfoot - and what makes me so confident is the way it walked, with slightly bent legs, long strides but a graceful fluid walking motion,” he added. 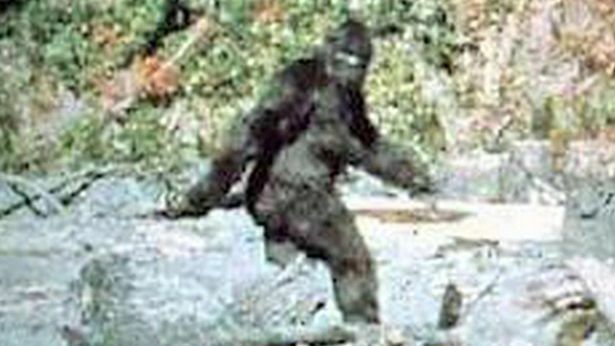 While sightings of a hairy creature which walks on two legs are an almost daily occurrence somewhere in North America – and the subject of TV series, books and films – even seasoned Bigfoot experts have questioned whether the animal could exist in the British Isles. But sightings continue to be reported to British Bigfoot researchers, from the dense woods of Suffolk to the remote mountains of Scotland. There have always been folklore tales of a hairy man-like creature living in forests of England - back in the Middle Ages they were known as 'woodwose'. One leading British Bigfoot researcher Deborah Hatswell said it was possible a Bigfoot-like creature could still exist in Britain. “In 2012, the Government produced the National Eco-System Assessment, and it showed that only between six and eight per cent of the land in Britain is actually built on – the rest is either forest, farmland or wild mountains or downs,” she said. “People who are open-minded about whether such a creature could exist in the vast forests of North America, might think Britain is too built-up, but it’s actually not. When you look at the reports of sightings in this country, they tend to follow rivers and forests,” she added. “There have always been folklore stories about wildmen living in the woods in this country – they date back centuries and have those stories have continued. “People are still reporting seeing these creatures that look like monkeys in the woods, running across the road at night, and in this case, walking along a hedgerow in a rural area near Bristol. “The thing that makes this witness so sure is that he was able to compare the size of the thing he saw with two people he saw a couple of fields away. The first thought is always ‘is this a man in a hunter’s ghillie suit?’, but the way it walked and its sheer size makes him 100 per cent certain,” she added. “He wasn’t someone with an active interest in Bigfoot before this incident, but it has changed his life. He found our research group online, and found somewhere to report what he saw. Now he’s going out doing his own research, looking for signs in the woods near his home,” she said.